Das Bergleben in Sundance kann so einfach und rein sein, wie Sie es machen. Unsere Ridgetop-Kabine verkörpert dieses Konzept mit den Notwendigkeiten eines glücklichen bequemen Lebens ohne den Flaum. Dies ist die perfekte Umgebung, um der Welt, in der wir alle leben, zu entkommen. Entspannen Sie sich im Whirlpool und genießen Sie die Aussicht auf den Berg. Timpanogos oder hängen Sie mit Ihrem Lieblingsbuch und Getränk auf der Veranda auf. Egal, ob Sie einen Solo-Rückzug, einen romantischen Kurzurlaub oder einen Familienurlaub benötigen, Ridgetop erfüllt mit Sicherheit alle Ihre Bedürfnisse. Als einzige Nachtvermietung in Sundance mit einem Tipi glauben wir, dass sich jeder in diesen Ort verlieben wird. Wir reden hier von einem luxuriösen Tipi in voller Größe, der mit einem bequemen Bett, urigen Möbeln und einer Heizung ausgestattet ist, um Sie nachts wohlig zu halten. Wir empfehlen jedoch, dass das Tipi eine saisonale Option zum Schlafen ist - wie die Sommersaison. Das Haus ist klein, aber was ihm an Platz fehlt, macht den Charme wieder wett. Verlangsamen Sie sich und genießen Sie das einfache Leben, wie es beabsichtigt war. Sie werden es nicht bereuen und möchten Ihr Leben nach einer kurzen Zeit hier vereinfachen. Die Hütte hat keinen Fernseher und wir betrachten dies als einen Service für diese Einstellung. Einige Feiertage sollten anders sein als zu Hause und die perfekte Gelegenheit, um Gewohnheiten zu ändern. Das Tipi kann sein, was Dichtungen der Deal zu diesem Ferienhaus. Kein anderes Hotel in Sundance bietet so ein einzigartiges Erlebnis. Jeder sollte in der Lage zu sagen, sie habe eine Nacht im Tipi verbringen. Diese Berghütte ist nicht mit einem Fernseher ausgestattet. Wir denken, Sie werden so zufrieden mit dem natürlichen Unterhaltung, die Sie nicht einmal bemerken Abwesenheit sein. Genießen Sie den Berg! We had a great stay at this cottage. Our boys loved sleeping out in the teepee and I loved sitting on the lawn taking in the beautiful sights and sounds of nature. The kitchen was ready to be used and many of the basics were there. The management team was attentive and super responsive when a light fixture shattered and needed to be cleaned up. I would highly recommend this cottage for a peaceful retreat. We loved the house, the decor is very graphic but warm and charming, the kids bedroom was perfect, and we felt very welcome overall. The tipi was fun for the kids, they really enjoyed it. Only negative point was that the a/c was noisy but we stayed in early September and didn't really need it so it wasn't a problem for us. A very nice stay, we would happily return! Thank you Raphael! We love the location and privacy of our Ridgetop cabin. Perfect for a small family or a couple wanting to hide away yet not be totally removed. The A/C was an added amenity due to a warmer summer. Happy it was available to knock down any uncomfortable temps during the day but sorry it was noisy. Most guests have found nights to be plenty cool and haven't had to run the unit while they were sleeping. Hope to get you all back again soon. Quirky and fun! Great for the kids! The home was very comfortable for our family of four. The kitchen was well laid out and very functional despite its small size. The main bath was a little tight for all for of us, but since we were on vacation it wasn't a big deal. We just planned a little extra time so that we could take turns getting ready in the morning. The best part of the home is the yard and front porch. Gorgeous views all around, plenty of grass for the kids to run around, an awesome little swing and of course the huge teepee. We walked to The Sundance resort and realistically it took 20 minutes down and 30 minutes back up to the cabin with munchkins in tow. There is also easy access to the Stewart Falls trail which was a surprisingly lovely hike. We enjoyed our stay very much and hope to return soon! Our family of five enjoyed this charming cabin. It's hard to beat such a beautiful place -- Sundance is so peaceful. The cabin itself is rustic, yet comfortable. We enjoyed its peace and quiet. Our kids loved the hot tub! We would have loved more comfortable outdoor seating to take in the views and nature. The teepee was cute, but didn't close entirely in the front. So no one was brave enough to sleep out there. A hammock and comfortable outdoor chairs would have been nice. Perhaps some board games and/or yard games. We appreciated the fresh bread upon arrival. It was a nice start to our first Utah adventure. Everything about this lovely house and the Stewart Mountain Lodge management services was wonderful. It served as a comfortable base of operations for a weekend full of wedding events at the nearby resort. I only wish we were able to spend more time luxuriating at the house. We (5 adults) would all consider returning for pure vacation purposes. Ridgetop Cabin was everything we needed for the perfect mountain getaway! There is so much fun to be had in the surrounding wilderness, but it was hard to leave the incredibly cozy and relaxing cabin! Here is a quick rundown on our memorable stay. First things first, the listing was spot on. 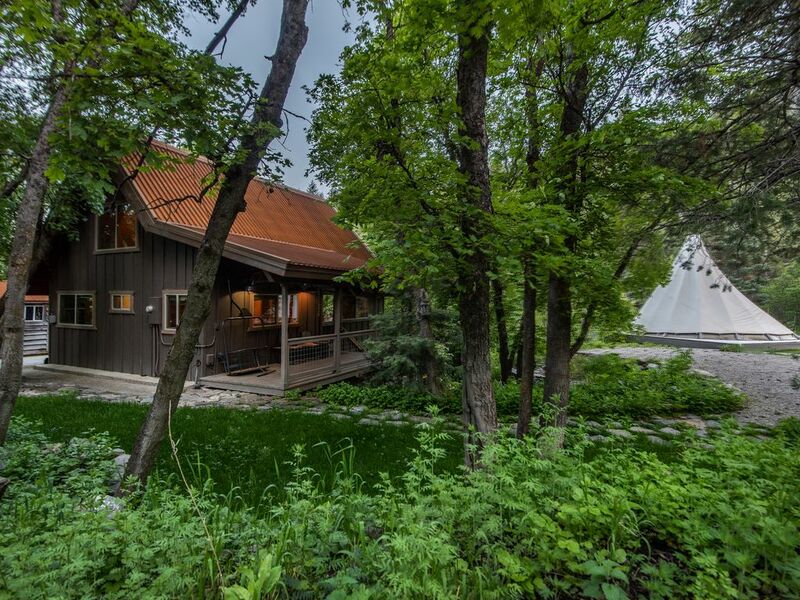 The photos accurately portrayed all aspects of the property and both dwellings (cabin and tipi), and the description made it completely clear what we could expect. Before our stay, we were personally engaged by the concierge with directions and assistance on anything else we might have needed before our arrival. We didn't take them up on many of these offers (activity bookings, grocery shopping, etc.) but were pleasantly surprised, and relieved to know they had everything covered in case we needed it. When we arrived, the cabin was spotless, fully stocked with everything we needed, and the hot tub was warm. We cooked all meals for ourselves in the fully-equipped kitchen and even used the grill one night! Though there was minimal cell service (trust me, you need it) Wyatt made himself available to our every need through email (there's free wifi that always worked perfectly) and he answered any miscellaneous questions we had about activities and outings. We fly fished and hiked in the surrounding area and it was so refreshing to know we had our cozy base camp to go back to. We just felt right at home. This isn't the biggest property in the area, but it's very homey and cozy inside and you'll feel so relaxed during every minute you spend at Ridgetop. I highly recommend this property and the entire Stewart Mountain Lodging group for any Sundance getaway.